Abu Simbel – How to get there? Want to see spectacular Abu Simbel? We can arrange a private excursion to the famous temples of Ramssess II by road, by air or with an overnight stay. The world-famous temples of Ramesses II and Queen Nefertari lie 280 km south of Aswan, overlooking Lake Nasser. Four colossal statues of Ramesses II dominate the façade of his great rock-cut temple. The nearby Temple of Hathor was also built by Ramesses II in honour of his favourite wife Nefertari. There are two ways to get to Abu Simbel. You can drive the three hours there and back or take a short flight. You can travel to Abu Simbel at any time between sunrise and sunset. By road, it will take you approximately three hours to get there and three hours back. A domestic flight from Aswan gets you there in approximately 30 minutes. You can spend about 2 hours at the temples. If you want to have more than 2 hours to see the temples, the best option is an overnight trip to Abu Simbel. You can stay in a simple but elegant Nubian hotel. Take the second convoy from Aswan to Abu Simbel and you will have the temples to yourselves. All tourists that came by road or air have already returned to Aswan. Great advantage: in the morning there is time for a second visit. And you can watch the sunrise light the temple facade. Magical! 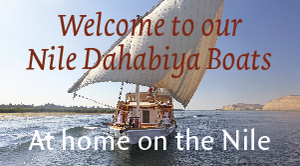 Lake Nasser cruises operate between Aswan and Abu Simbel for three or four nights. In either direction, the cruise itinerary allows you plenty of time to explore the Abu Simbel monuments.